Ultra Fish Oils is a range of pharmaceutical grade fish oils designed to meet the highest quality and purity standards appealing to those who are looking for the best marine oils available. Ultra fish oil capsules are high in strength, with over 60% Omega-3 fatty acids and are produced in Norway to the highest purity standards. 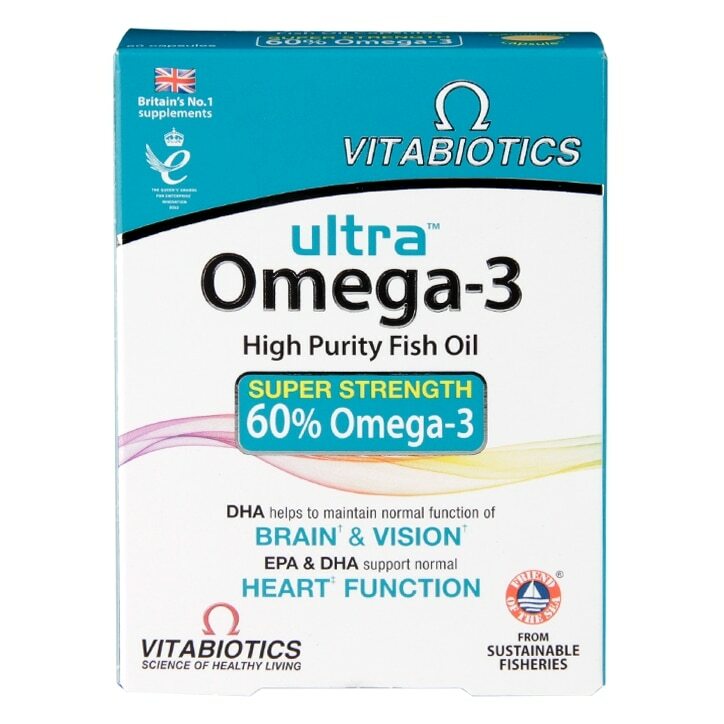 Ultra Omega-3 provides a rich source of DHA and EPA as well as Vitamin E. EPA and DHA are classed as essential fatty acids because they cannot be made efficiently by the body and must be obtained through the diet. DHA contributes to the maintenance of normal vision and brain function . Both DHA & EPA contribute to the normal function of the heart. Take two capsules per day, preferably with a meal and a drink such as milk or orange juice. Omega-3 fish oil (from Fish), Capsule Shell (Pharmaceutical Grade Gelatin, Glycerin, Orange Flavour), Vitamin E (D-Alpha-Tocopherol) (from Soya). No artificial colours, preservatives, starch, gluten, sugar, salt or yeast. Do not exceed recommended intake. Seek professional advice before using if suffer from any food allergies or are allergic to fish or fish products. Store at or below 25°C, in a dry place. Protect from sunlight and direct heat. Always read the product directions before use. Do not exceed the recommended intake. As with other supplements, seek professional advice before using if you are pregnant, breastfeeding or suffer from food allergies, or are allergic to fish or fish products . If you have epilepsy or are taking oral anti-coagulants (e.g. warfarin) consult your doctor or pharmacist before using this product. Vitamin supplements are not intended to treat or prevent any disease. Food supplements must not replace a balanced and varied diet, and a healthy lifestyle. Vitabiotics Ultra Omega-3 is rated 4.7 out of 5 by 14. Rated 4 out of 5 by Dr G from Great Product Fast delivery. Good/safe packaging. Good quality product.